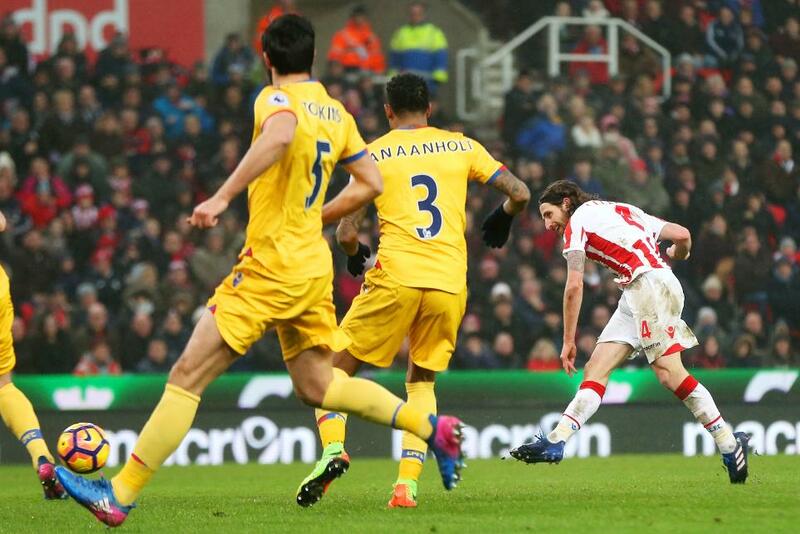 The Stoke City defence dominated the Fantasy Premier League bonus points in Saturday's 1-0 victory over Crystal Palace. A towering performance from Bruno Martins Indi (£4.9m) rewarded the centre-back with the maximum three points via a score of 36 in the Bonus Points System (BPS). The defender contributed 12 clearances, blocks and interceptions (CBI), won three tackles and completed 88% of 43 passes. Potters left-back Erik Pieters (£4.6m) was awarded two bonus points, totalling 24 in the BPS. He produced seven CBI and won a pair of tackles to help register a seventh clean sheet of the campaign for Mark Hughes' side. Four players shared a tally of 23 in the BPS to pick up a single bonus point apiece. Stoke goalkeeper Lee Grant (£4.4m) made nine recoveries and a single save, while Ryan Shawcross (£4.9m) contributed eight CBI. Ramadan Sobhi (£4.8m) provided two key passes, including the assist for Joe Allen's (£5.1m) winning goal, and completed a pair of dribbles. Following his decisive strike, Allen was the final beneficiary of bonus points. The Welshman would have scored higher in the BPS had he not missed the target with one effort and been tackled on four occasions. With only 13 goal attempts created by both sides it was a low-scoring contest in the ICT Index at the bet65 Stadium. Stoke's Marko Arnautovic (£7.1m) ranked top with 7.4, producing the highest Threat score on show (32). The Austrian tested the Eagles' resolve with two attempts on goal, hitting the target with both. Arnautovic also completed the most passes in the attacking third (13), although it was team-mate Charlie Adam (£4.7m) who tallied the top Creativity score of 37. He laid on two chances and completed three of five attempted crosses. Once part of more than 800,000 squads back in Gameweek 12, Allen's ownership has now halved following a drop-off in his FPL output. Saturday's strike was his first goal or assist return since Gameweek 17, perhaps suggesting that he can still be a factor in our seasons. But there is currently limited interest in Stoke City's assets. The Potters next travel to face a Tottenham Hotspur side who have kept more clean sheets than any other team at home. Like Palace, they may also suffer a postponed fixture for Gameweek 28, should their opponents over that weekend, Manchester City, progress to the FA Cup quarter-finals. The Eagles host Middlesbrough and travel to West Bromwich Albion over their next two Gameweeks, ahead of a testing season run-in. Their defence has kept a single clean sheet in their last 11 Gameweeks, while they have stalled badly in attack. Christian Benteke (£7.2m) has scored once in his last 10 Gameweek starts and Wilfried Zaha (£5.6m) has failed to ignite siince returning from the Africa Cup of Nations (AFCON). He has failed to provide attacking points in his last three starts, with a single goal scored in his previous eight outings.